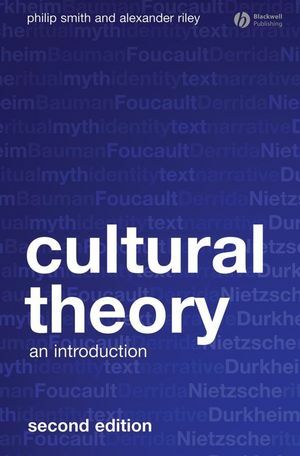 This second edition of Cultural Theory provides a concise introduction to cultural theory, placing major figures, traditional concepts, and contemporary themes within a sharp conceptual framework. Philip Smith is Associate Professor of Sociology at Yale University and Deputy Director of the Yale Center for Cultural Sociology. His books include Cultural Theory: An Introduction (Blackwell, 2001), Why War? The Cultural Logic of Iraq, the Gulf War and Suez (2005), The Cambridge Companion to Durkheim (with Jeffrey C. Alexander) (2005), and Punishment and Culture (2008). Alexander Riley is Associate Professor of Sociology at Bucknell University. He is the author of Godless Intellectuals? : How Durkheimian Sociology and Poststructuralism Reinvented the Intellectual Pursuit of the Sacred (2008). Introduces entirely new chapters on race and gender theory, and the body. Other new material includes treatments of thinkers such as Nietzsche, DuBois, and Eagleton, and considers important contemporary themes, including virtual reality and cosmopolitanism. Considers themes that have become more important in theoretical activity in recent years such as computers and virtual reality, cosmopolitanism, and performance theory. Draws on theories and theorists from continental Europe as well as the English-speaking world.